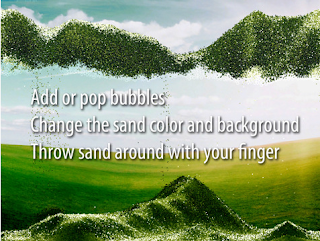 Developer Quote: "Sand Pictures creates beautiful landscapes from falling sand and rising bubbles. It is just like the sand picture frames in the real world, except on iPad you can interact!" It's mid-week and I'm already burned out, so I was looking for a relaxing app to enjoy on my iPad. I don't want to have to put a lot of thought or effort into a game at this point. I came across Sand Pictures today which reminds me greatly of old-fashioned sand art in a bottle that I used to play as a child. Are you familiar with that activity using several different colored sands, and creating a layered look in a container? Sand Pictures is similar in that you get to manipulate and move the sand grains to your liking. However, they are not confined to a bottle, but move freely across your display. 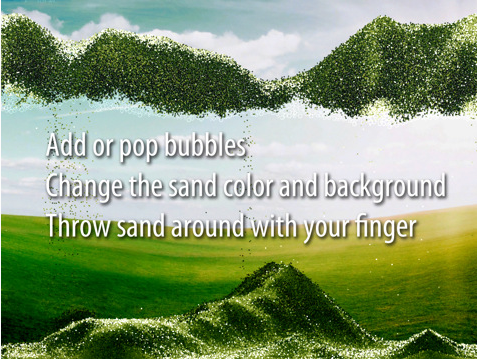 - Push grains of sand around with your finger, or pop bubbles with a tap. - Hold your finger in one spot to add more bubbles. - Change between the 20 beautiful background images with only a two finger swipe to the right or left. - Choose your own image from your photo library instead of using a prepared background. - Change the color of the sand through over 50 built in color gradients by dragging with two fingers up and down. - Turn iPad any way you like and the sand will fall in different directions. - Turn iPad over to flip gravity and create a new picture. - Tap the rotate button to let Sand Pictures flip the image for you. - Save the landscapes you create to your photo library, or post them straight to Twitter or Facebook with just a couple of taps. Enjoy the sound of bubbles and shifting, swooshing sand as you swipe your way through a sandstorm. Take one of your own pics, and cover the background or an object with sand. The grains of sand are quite amazing and you can almost see each one individually as they shift and relocate. Sand Pictures is a form of art definitely worth exploring. COOL CONCLUSION: "Sand Pictures is an unusual and unique form of art that is relaxing, simple, yet beautiful to create." --Special Note: Sand Pictures is on sale at over 60% off for a limited time!